One of my favorite ways to get over blank canvas syndrome and begin a piece of mixed media art is to create an interesting background effect that can be a base for building images and themes onto. It's so much fun to improvise with different ways of applying paint and to experiment with ways to achieve these special effects. One of these days, I'm going to create a library of images and techniques for creating all the texture effects I know. Consider all the different surface and color combinations and the possibilities are endless! Lately I'm loving the fibery look and I'm a nut for anything distressed and worn looking. 1) cheesecloth dyed with acrylic paint and stamped onto card stock. It almost looks like crackled paint! 2) acrylic wash (paint thinned with water) and brushed over torn antique book page. The text adds an extra layer of visual interest, and I love the way the paint seeps into the tears. 3) acrylic gesso (white acrylic primer) brushed onto burlap. 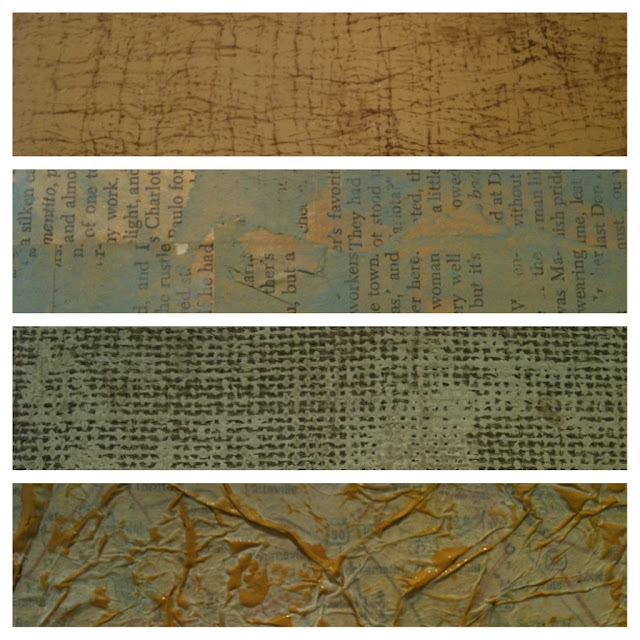 Reminds me of the weathered and deeply textured look of fabrics that have been exposed to salt water and sun. 4) acrylic paint spread onto wrinkled tissue paper with a palette knife; I love the way the ridges of the wrinkled paper pick up the paint color for a veiny effect. The tissue was first glued onto a map page (so it would hold it's wrinkles)- can you see the roads peeking through? These are my bases for works of art to be born on. Beats staring at a blank canvas and wondering where to start. It occurred to me recently that so much of these distressed layers and textures are showing up in digital art these days. One day, when Santa Clause gifts me with Photoshop, I may experiment with this, but I know I'll never leave behind the hands-on messy fun. I love all of the neat textures. I have an older version of print shop that I adore. I've bought 2 different upgrades to it and I always go back to the old one (the others don't have as many options and they are WAY to high tech for me) I have been using the background techniques they have for pictures and collage pages for a long time and have A LOT of fun doing it! Happy texturing!